If you’re anything like me, after a few months of hibernating during the winter months, you’re either über productive or way too cozy catching up on your favorite Netflix shows. To keep myself from getting into a rut of cuddling on my couch under a blanket much too often, I decided to branch out and commit to trying something new every month. This month, I wanted to tackle my most annoying skin concern…my dreaded, but oh-so-obvious dark spots. 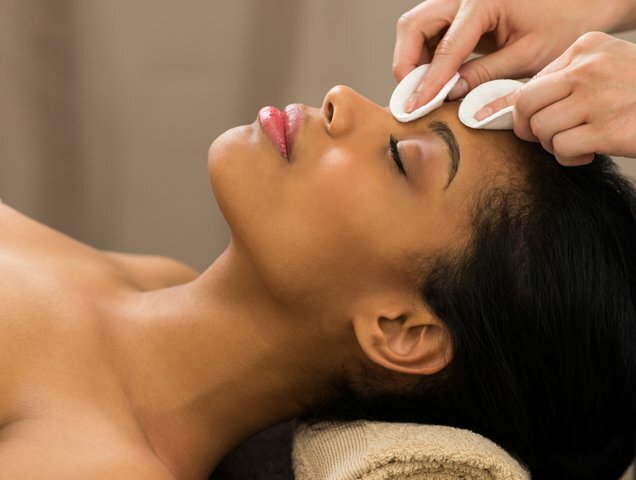 After nearly five years of being a beauty editor, I’ve heard many editors and beauty experts rave about chemical peels and how the results leave you glowing and flawless. Being a beauty minimalist, however, anything with the words chemical and peel didn’t seem appealing to me, especially when the two words are side by side. After tons of research, I bit the bullet and got my very first chemical peel. After my first session, I wanted to shout from the rooftops about how much I loved the experience and wanted everyone around me to experience the glow as well. I chatted with Kevin Oh, owner of KUR Skin Lab and licensed esthetician, to get the lowdown on chemical peels, what they are, why they work and why you need to book your appointment stat. When I stepped into KUR Skin Lab in New York City, I must admit I was slightly terrified about the treatment but surprised at how simple it really was. “For first-timers, getting a chemical peel is a surprisingly relaxing process,” shares Oh. The first step is very similar to a facial with the esthetician cleansing and toning skin before applying the peel solution. Once your face is cleansed and free of dirt and debris, the esthetician will apply the acid or blend of acids and ask what your “tingle level” is on a scale of 1 to 10. For me, I was at a one to two for the majority of the peel process. “It is important to be honest about how strong the solution feels on the skin to ensure the clinician applies the appropriate number of layers for your skin,” Oh says. The peel experience will end with an application of corrective serums, moisturizers and a broad spectrum SPF to moisturize and replenish skin from the acid solution. You won’t peel instantly but instead, you’ll leave with a glowing and hydrated complexion. Over the next few days, you should prepare to see some variation of peeling. How much you peel will depend on 1) how many layers of the solution was applied and 2) how your skin reacts to the solution. Peeling can range from “minor flaking to extreme sheeting,” Oh says. Now that you understand how it works, here are a few reasons you might dare to give it a try. We all want to know the tips and tricks to slow down signs of aging. But sometimes we buy every anti-aging cream, serum and gel on the market and those pesky fine lines are still visible. “Aging is a big concern for clients and a chemical peel can help reduce fine lines and wrinkles, laxity and dullness that is common with aging skin,” says Oh. While some doctors may recommend laser methods for reducing wrinkles, a series of chemical peels is also a great option for improving skin texture. When struggling with acne-prone skin, those unwanted bumps can be quite a damper on your mood. “For acne, chemical peels can help control oil production and reduce the buildup of acne-causing bacteria in the pores,” shares Oh. These types of peels can not only treat the acne, but also improve any scars left from acne inflammation. If you’re concerned about skin sensitivity, ask your clinician for a solution with a gentler blend of acids like the PCA Skin Sensi Peel that is also great for people with darker skin tones. Do you dare to try? Consult with your dermatologist to find the perfect peel to target your skin concerns. 14 Non-Tacky Valentine’s Day Manis You’re Sure to LoveDo You Really Have to Toss Your Makeup After You’ve Been Sick?